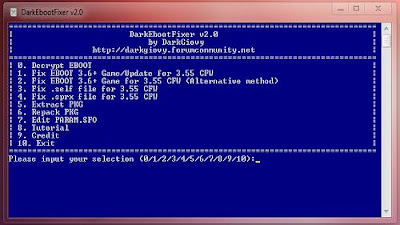 Today developer DarkGlovy has released a very simple command line tool that allows the average joe developers to resign their own EBOOTs for CFW 3.55 with ease. Unfortunely this only comes in Win32 & Win64 versions and nothing new for my new macbook. Check out the release notes and the download link below. The tool is extremely easy to use, you can just put EBOOT.BIN of the game that you want fix, into the folder of tol and run DarkEbootFixer.exe. There are 10 options, you type 0 and click on ENTER, the tool convert EBOOT.BIN to EBOOT.ELF; Next type 1 and click ENTER, the tool fix the EBOOT.ELF and generate fixed EBOOT.BIN. Put the new EBOOT.BIN into the folder of game and Enjoy! Note: Some games may require the fix file .sprx - .self or .edat. EDIT Param: With this option you can edit param.sfo. NOTE: the file must be named "PARAM.SFO"